IID is a public policy institute that promotes informed public participation in the public policy process. IID is registered as a nonprofit organization in Bangladesh under Section 28 of the Companies Act 1994. Making policy public for an informed, inclusive and democratic society. There are two dimensions to policy advocacy: approach (how you engage) and outreach (where you engage). Approach can be critical or supportive, while outreach can be public or nonpublic. Every attempt at campaigning is always some combination of these two. There are pros and cons of using each type of outreach/approach. For instance, a public dialogue may not always be conducive to very open discussion but it has the advantage of reaching a wider audience; a highly negative/critical campaign can be counterproductive by putting policymakers on the defensive but solely relying on playing a supportive role may lead to non-action. 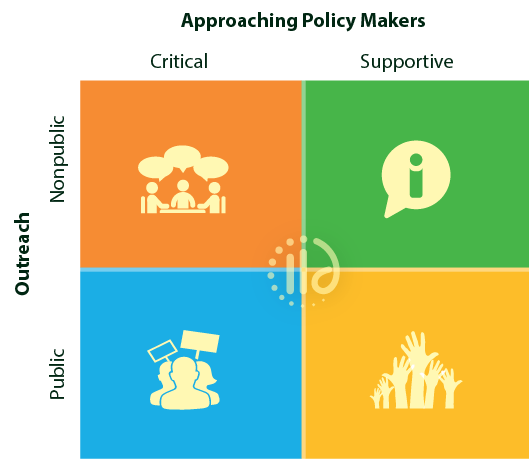 We have found that what works best in campaigning for change is to engage on all four combinations represented by the four quadrants – ie, nonpublic-critical, nonpublic-supportive, public-critical, public-supportive. IID developed this model to guide its advocacy strategy. IID is active on all these levels through its various programs and events. Public-Critical: IID programs like media briefing, advocacy campaigns, media reporting and Policy Forum are to influence the policymaker when it fails to notice issues of public interest. For example, see campaign against article 57 of ICT act, digital security act, broadcast policy, education etc. Nonpublic-Critical: IID programs like Policy Breakfast that follows Chatham house rules offers critical engagement in a non-threatening way. For example, see policy breakfasts on culture, gender budget, political participation, etc. Public-Supportive: On some issues, CSO-government partnership make better impact on governance and development. For example, see voter registration campaign, RTI campaign, library programs, etc. Nonpublic-Supportive: Project evaluation, capacity building and program supports from IID are meant to help the policymaker achieve national development goals. For example, see evaluation of a2i project, support to BCC, etc.